When to fish for Trophy Pike? Trophy fishing at Silsby is great spring, summer and fall. However tactics do change throughout the season. If you like sight-fishing in the bays and catching high numbers of fish then the spring is for you. If you like the good weather, fishing the weed beds and catching the heaviest fish of the year then the summer and fall months would be more to your liking. Below we give you a basic description of what to expect during all times of the year. Whether you choose the spring, summer, or fall we are sure our trophy pike will create exciting memories. Ice-out varies from May 15th to June 1st with the average being May 20th. Due to cold fronts that come in and out of the area, temperatures can range from 35 - 80 degrees, so bring layers of clothing. 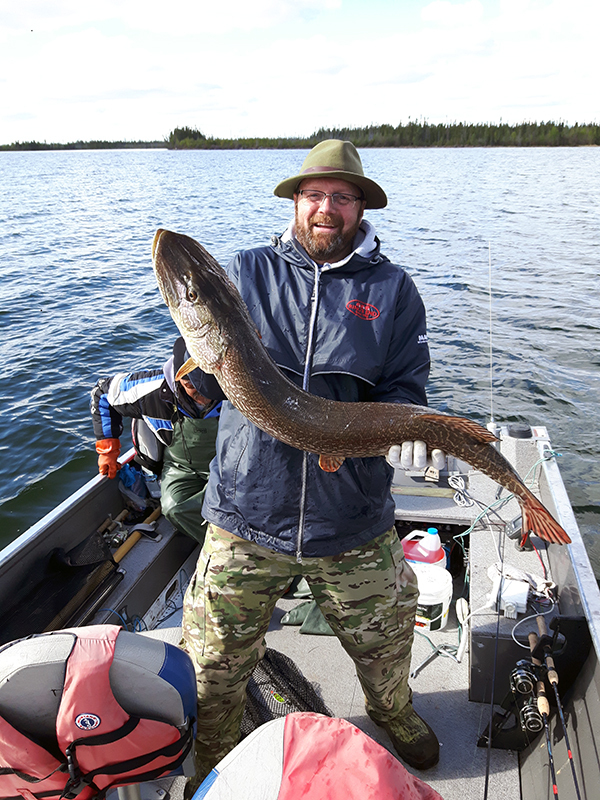 The trophy pike are in flat shallow bays & river mouths. The big post-spawn female trophy pike are looking for the warmest bays. Find the warm water and you have found the active monster pike. This is the time of the year when sight-fishing is best as the trophy pike will be in the shallow bays sunning themselves. 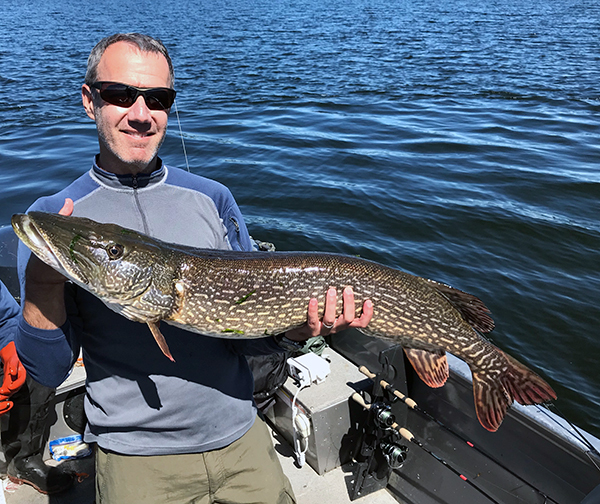 Bill MacDougall (above) shows off one of his multiple trophy Pike during his trip to Silsby in early June of 2018. The suckers spawn in and around the rivers and creeks, which usually starts a feeding frenzy for trophy pike. This time of the year we usually have the best success with smaller baits such as medium sized Johnson spoons, Daredevils, Mepps #5, Blue fox #6, slow wobbling crank baits, and top water baits. This time of year the weather is more stable. Fishing becomes more consistent with temperatures averaging 50 - 80 degrees. There are fewer cold fronts thus fish are less affected by the weather. This far North, the water stays cool so there are no mythical "dog days." 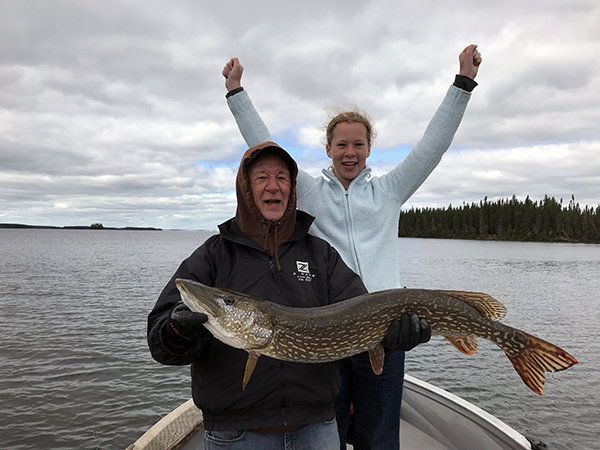 For instance, our guests sometimes catch more Master Angler Northern in July than our guests do in the first week of June. On Silsby and High Hill lakes, pike stay in the thick cabbage weeds in depths of 6-10 feet. Fish the edges of the cabbage and you'll catch trophy Pike. At this time the 45" pike that weighed 25 pounds in the spring are now 30 pounds and full of energy as their metabolism is at the highest peak due to foraging since ice out. This is the time to catch the heaviest fish of the year and many of our guests seeking the bubba bean trophy pike come year after year during the summer months! When is the best time to fish for Trophy Pike? I get asked this question on a constant basis over the years. The familiar answer of "it's hard to say" is actually true at Silsby. Our guests catch Just as many trophy Pike in July as they do at ice out. For instance...we have had a week in June produce 28 trophy Pike on Silsby. The same year we had a week at the end of July produce 30 trophy Pike. See..."it's hard to say." The lodge record pike of 53.5 inches was caught in mid-August in the weeds. The big females have big meals on their diet at this time of the year so bring lots of big baits such as large Johnson Silver Minnows, Large (Musky size) Tandem spinner baits, Stick baits like Bobby baits, Reef Hawks, Suicks, and Mann's minus one super stretch. Late August produces our biggest Pike of the season. These giants are filling up on smaller fish that come to the reefs to fill up on craw fish that live on these rocky shelves. The weather this time of year has usually cooled off and the bugs are minimal or gone. Nothing beats the scenery in late August and September with leaves changing colors and the Northern Lights dancing on clear nights. 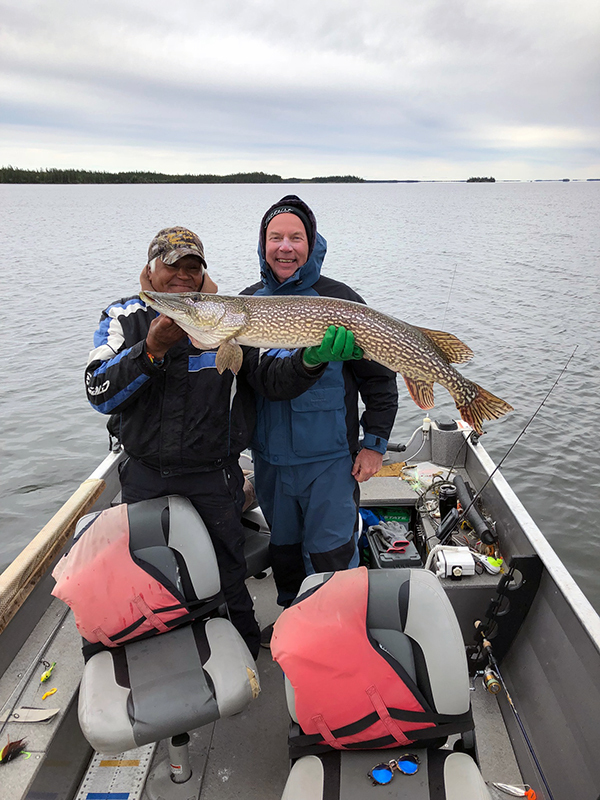 Albert Brown (below) with one of his multiple trophies (this one was 45 inches) in late August 2018.